Your guide to protecting your home from power outages. We’re all aware of catastrophic storms that can knock out power to millions. 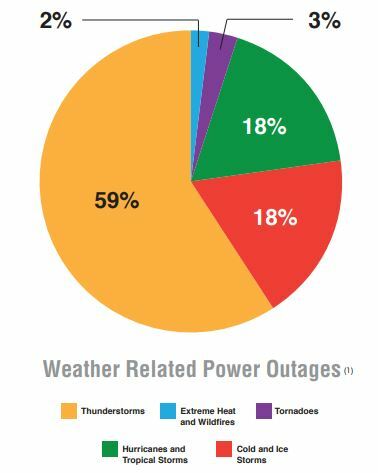 But, while hurricanes and tornadoes grab the headlines, the fact remains that nearly 60% of all weather-related power outages are caused by thunderstorms that can occur almost anywhere. Of course, if you happen to live in an area frequented by hurricanes, tornadoes, or even ice storms, a home backup generator should be a given. But even if you live outside these severe-weather areas, you are very likely to face as many—possibly even more—power outages due to thunderstorms. …and the damage can be costly. A Generac automatic standby generator system is always on guard… so you don’t need to be. Utility Power is Lost: Perhaps it’s a storm. Maybe it’s a grid failure. In any case, the electricity you depend on is suddenly gone. Your System Detects the Problem: Within seconds, your generator prepares to restore your home’s power. Your Generator Turns On: Whether You’re Home or Away. Within a few seconds, it is up to speed and generating electricity. Your Power is Restored: The automatic transfer switch sends generator power to your home. And it will continue until utility power returns. If you prefer a simple, economical approach, our affordable PowerPact™ line provides automatic backup protection for essential circuits such as your well pump, refrigerator, furnace, and sump pump. Our Smart Module Management (SMM) system allows you to get whole-house protection, without paying for a larger generator. All of your home’s circuits can be protected by cycling power on and off as needed for different appliances—and you decide what gets priority. Many homeowners want the peace of mind that comes with whole-house coverage. Whenever there’s an outage, you don’t have to worry because the power stays on at all times throughout your entire home. Choosing a site: When considering the location for your generator, you will want to fi nd a stable area that is well-drained and does not flood. Keep in mind that the generator can be no closer than 3 feet to utility meters, air conditioning units, combustibles or anything serviceable. And the closer the site is to the electric meter and the natural gas supply line, the more you’ll save on installation. Once the site is chosen, your installer will take care of any required local permits. 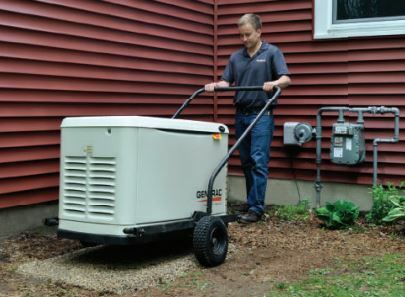 Installing a Generator: Prior to placing the generator, the site needs to be prepared. Usually this is achieved by putting down a bed of pea gravel or pouring a cement slab. Your installer will make sure the placement allows for all the right clearances (18″ from the house, 60″ from doors, windows and fresh air intakes, 36″ in front to allow for a technician to perform any future checkups or maintenance). Connecting Fuel and Electrical: With the generator itself in place, a transfer switch will be installed next to your main breaker box (in some cases it may replace the breaker box entirely). Wiring is then run, in conduit, between the generator and the breaker box. Then the fuel line gets installed. Simulating an Outage: Once installation is complete, your dealer will simulate an outage to make sure your new generator and transfer switch work exactly as they should in the event of a power outage. The fi nal step is setting up your generator’s “exercise,” a weekly test run to ensure that everything is in good working order and ready for a power outage.